…would rather find a reason to be offended than see humor, even if that humor isn’t their style. Such folks are professional victims. 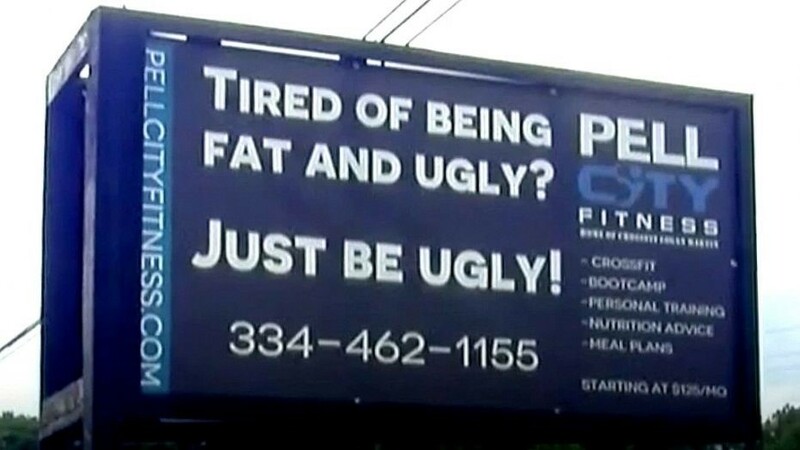 Here’s an advertising sign that one physical fitness gym owner has put up to advertise his business. Folks actually are up in arms over this. Is the joke for everyone? Of course not; no joke is; not even those told by Milton Berle or Bob Hope. That’s a big so what, though; humor varies from person to person. Nevertheless, professional victims are calling him out for fat-shaming folks, for bullying folks. Snowflakes need to get over themselves. If they don’t want to be fat, then they should take steps to stop being fat. If they say they’re satisfied with their bodies and don’t want to be called out for their shapes, then they should be satisfied and stop worrying about what strangers say. After all, the only ones these folks—anyone, come to that—need to please is themselves first, and then their significant others. And their bosses if they work for a company for which public appearance matters to the business. This entry was posted in culture, humor, morality and tagged culture, humor, morality, responsibilities by eehines. Bookmark the permalink.